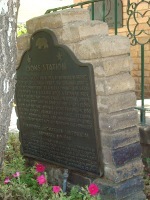 The Lyons Station stagecoach stop is now Eternal Valley Memorial Park. This site was the location of a combination store, post office, telegraph office, tavern, and stage depot accommodating travelers during the Kern River gold rush in the early 1850s. A regular stop for Butterfield and other early California stage lines, it was purchased by Sanford and Cyrus Lyons in 1855, and by 1868 at least twenty families lived here. Eternal Valley Memorial Park has called their final resting place "The Garden of the Pioneers." 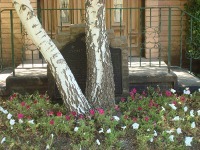 ... someone planted a tree in front of the plaque.